Flavius Magnus Magnentius Augustus was a usurper of the Roman Empire from 350 to 353. Born in Samarobriva (Amiens), Gaul, Magnentius was the commander of the Imperial guard units. When the army grew dissatisfied with the behavior of Roman Emperor Constans, it elevated Magnentius. Constans was abandoned by all except a handful of retainers, and he was slain shortly afterwards by a troop of light cavalry near the Pyrenees. 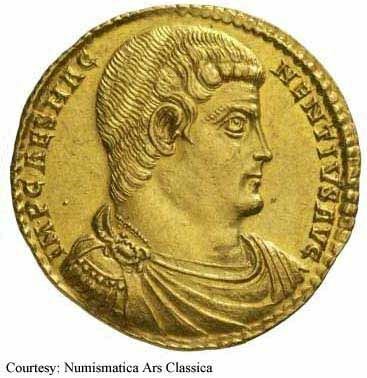 While Magnentius received the support og Britannia, Hispania and Gaul, Emperor Constantius II would have none of it and marched to battle. After a series of defeats Magnentius fell on his sword in 353.